You will earn 4,751 Reward Points. Earn 1 reward point for every 1 dollar spent. Set of (4) polyurethane non-marking swivel casters w/ front brakes. U.S. Range Cuisine 36" (914mm) wide Heavy Duty Range Series. Stainless steel front and sides. 6" (152mm) legs with adjustable feet. 18" (457mm) Section Hot Tops - 32,500 BTU/hr each burner with one per place. Open Burners - 30,000 BTU/hr per burner with center pilot. A one piece, cast iron top grate covers two open burners. 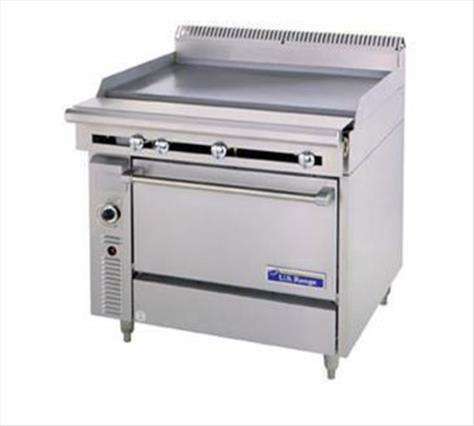 Griddle Tops - 1” (25mm) thick steel plate griddle with 3" (76mm) wide grease trough. Burners rated 30,000 BTU/hr each. One burner per 12” (305mm) section. Ovens - One piece oven door. Stainless steel oven interior with a heavy- duty, “keep-cool” door handle. Standard oven comes with a thermostat with a temperature range from 150° (low) to 500°F (66°-260°C). One chrome plated oven rack for standard ovens and three for convection ovens. NOTE: Ranges supplied with casters must be installed with an approved restraining device.